The Feast site in South Africa has been in the Margate area of the East Coast of South Africa since the formation of the United Church of God. However, an exciting and far more suitable site has been located on the Southern Coast of South Africa in the historical town of Mossel Bay. View from the hotel in Mosel Bay, South Africa. 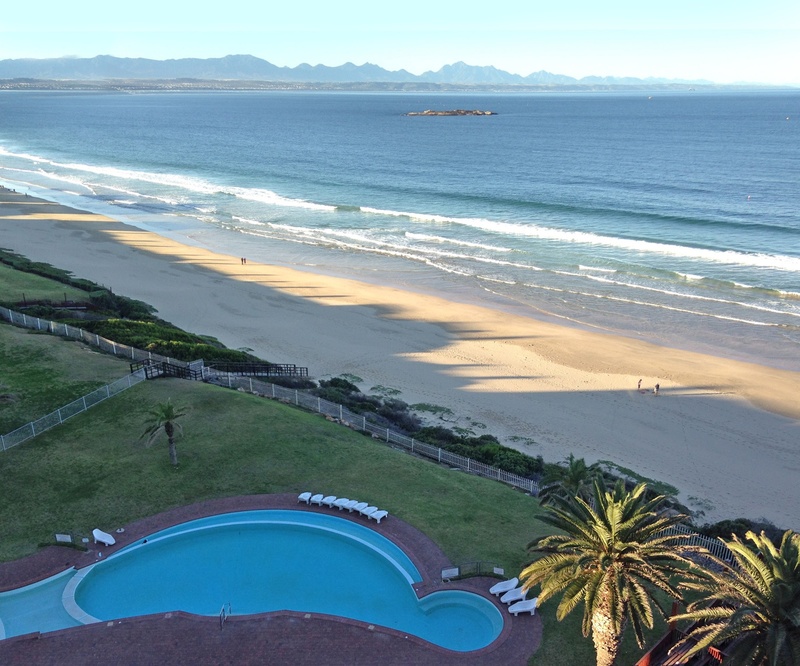 This place is at the beginning of what is known as the “Garden Route”—an area popular with both local and international tourists that stretches along the coast and is characterized by beautiful vegetation and scenery. Overseas visitors would land at Cape Town or O.R. Tambo International Airport in Johannesburg. They will then fly to the George domestic airport (less than an hour from Cape Town and just under two hours from O.R. Tambo), which is only 39 kilometres (24 miles) from Mossel Bay and is easily accessible by taxi or hotel shuttle. Driving from Cape Town is also an option—a scenic drive of about five hours, allowing for beautiful stops along the way. The hall is located in the Diaz Hotel and Resort conference facility, which is a fine modern facility with direct beach access. All rooms face the Indian Ocean. Besides the hotel, there are many self-catering accommodations available in the immediate vicinity. With the proximity of shops and facilities, and the availability of taxi services, there is no need for brethren to have a vehicle. The hotel provides an extensive buffet breakfast, as well as three-course dinners that are available to all Church members whether they are staying at the hotel or not. Restaurants and coffee shops are available on-site and nearby. The cost of hotel accommodation is extremely reasonable due to the weak local currency. Assuming a conversion rate of R14/US$1, the hotel accommodation would be R1170 or $83.57 for double/sharing per night, including breakfast. A room for one person would amount to R689 or $49.21 per night. The total facility is large and overseas visitors are welcome and encouraged to experience this new opportunity! Apart from the prime purpose of appearing before God at this appointed time, the opportunities for fellowship are tremendously enhanced by everyone being together in the same area. Free time during, before and after the Feast can be spent relaxing or touring, with exceptional opportunities provided by attractions such as: The Diaz Waterpark, adjacent to the hotel; two nearby game farms offering four of the “Big Five” animals; boat trips to seal island and for whale-watching; a lighthouse tour; the Bartholomew Diaz Museum; the Diaz rail express; wine and craft beer tasting; and a Shark Cage diving trip for the more adventurous. A little farther away are the world-famous Cango Caves and ostrich farms in Oudtshoorn, situated over the magnificent Outeniqua Mountains. Mossel Bay claims to have the second most moderate climate in the world after Hawaii and boasts 320 sunny days each year. For more information view the full brochure online or contact Isella Wallis at UnitedChurchofGod.SA@gmail.com . International guests are asked to register online. For more information and to register go to: www.ucg.org/members/feast/sites/2019/mossel-bay-south-africa .